No sun, no problem as the Seawolves took a commanding 5-2 win against Holy Names University on Saturday, April 6. Pouring their effort in, the Seawolves fought for dominance in both doubles and singles matches. With a quick win in doubles against Holy Names, the Seawolves had to fight back the relentless single matches Holy Names put forth. Only losing two matches in singles towards the end of the day showed that Holy Names was not going down without a fight. This hard-fought victory showed possible areas of improvement for the Seawolves as well as areas of success. Igor Pissarenko, a senior on the team, supported his teammates by winning all of his matches. “I contributed two points to the team,” Pissarenko said. In doubles, he won the match 6-2. In singles, he won both first and second sets 6-3 and 6-0. Sophomore Harry Cohen had a great day for the team. “It was tough, but our coach always tells us to fight, I put 100% effort on the court. It worked out today,” Cohen said. 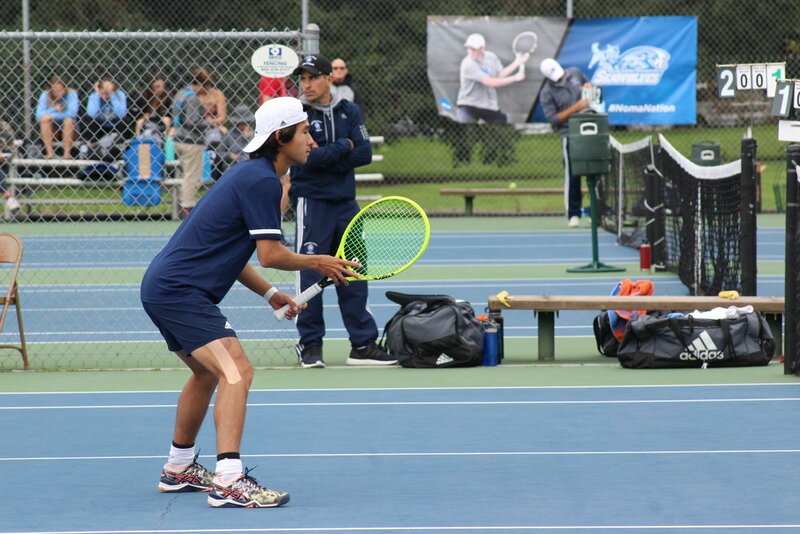 Alex Wong, a junior, delivered an eventful day as he participated in doubles and singles matches. He described his experience of the matches as “high and low, [Holy Names] is a good team, [we] still came out with a W,” Wong said. A lot of the sets were going either way and each point was heavily fought for. Nobody was letting anything go easily. The team took every game seriously against Holy Names, and they will use that same determination to work to get into regionals. Cohen dreams big, wearing a determined expression as he looks towards the Seawolves future. “[lets] get a ring on our fingers,” Cohen said. Tennis is seen to the majority as an individual sport as it is often set up in singles or doubles, but not as a team effort. The idea of collecting points off a win make each match matter so the sets are deliberate and all equally share a similar responsibility. “If I can contribute to the team I can contribute to myself,” Pissarenko said. Many of the matches of this game were determined in tie-breaking third sets against the Seawolves and the Hawks. It is reasonable to say they were evenly matched in a physical sense, but what really made the difference is the mental side of the sport. In this tennis game, there were a lot of very close matches and Harry Cohen has understood this aspect of tennis. “[The] biggest thing for me is the mental game,” Cohen said. With a lot of rain delays, the men’s tennis team was lucky to play as they had a moment of warm air to dry up any leftover puddles from the afternoon's showers. Down the road, they will travel to Reno and play against University of Nevada on April 12.